San Francisco is a city celebrated for its progressive history, distinctive architecture and phenomenal geography. It is also one of the major urban centers in the region. Home to roughly 800,000 people, it’s expected to grow to nearly 1 million residents by 2035. To accommodate this growth, new homes and businesses will need to be built and existing buildings repurposed. 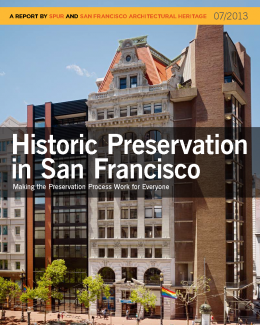 San Francisco Architectural Heritage and SPUR believe it is critical to protect the historic fabric of the city. We also believe it is critical to support growth and change in the right locations. In this joint policy report, Heritage and SPUR examine the city’s processes for preservation planning, project review and decision-making. We describe what is currently working well and what is not. We then recommend measures to more fully integrate preservation into land use planning, including improvements to the processes for conducting surveys, creating historic districts and reviewing proposed changes to historical resources. The SPUR Board of Directors reviewed, debated and adopted this report as official policy on May 15, 2013. The San Francisco Architectural Heritage Board of Directors reviewed, debated and adopted it on May 16, 2013. Special thanks to John Rahaim, Tim Frye, Tina Tam, Gretchen Hilyard, Mary Brown and Alexandra Kirby from the San Francisco Planning Department for their help with this project.